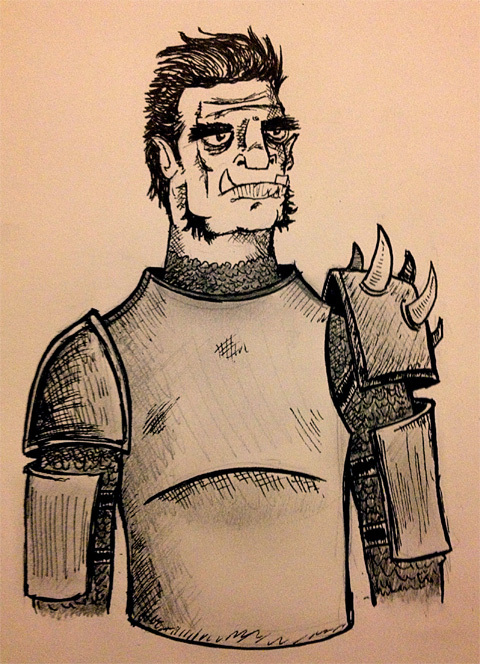 This week we’ve got a half-orc fighter. He’s regal, he’s a great knight in the king’s armor, but he can’t deny his brutish nature. Nameless PCs » Fan Art Friday/Name This PC Mashup! When I see this picture, I go kind of the opposite route. I see the regal armor and demeanor, but I see it as a front. I imagine that his tribe of Half-Orcs were tired of being backwater raiders and decided to put on airs. They had recently slain the local lord’s guards escorting a large shipment of golden bullion and decided to keep the armor instead of smelting it down for more, shoddily crafted weapons. So Urgnog set about in a long con. He went to a local village dressed in some of the ornate armor. He posted fliers about his services as a mercenary and was eventually hired. He worked his way up, saving almost every coin (save for a few drinks here and there,) from caravan guard to adventurer. It wasn’t until a year later that Urgnog found what he was looking for all along, a mountain of gold. His adventuring party all died from the dragon. Or at least that is what he told anyone who asked. He brought the mountain of gold, over the course of days, weeks, and months, back to the Blood Reavers, and once there he constructed walls and gave the Reavers actual facilities. A school house for the pups. A latrine and landfill for their collected “waste”. A real armory and real martial training. A few generations passed and Urgnog died going out to adventure again for the good of the Blood Reavers. All that remained of him was a portrait he had commissioned, the picture seen above. Over 50 years, the Blood Reavers went from mindless tribal savages to one of the most elite fighting forces in the lands. As mercenaries they found much glory and fighters and knights from all over came to study their fighting style. Because of the vision of a single Orc, Urgnog the Bloodied, the Blood Reavers had achieved the perfect combination of advancing civilization while retaining their culture.